In the first general election for more than 10 years, Winston Churchill found himself and his Conservative Party flattened by a shock Labour landslide. Despite leading the UK through much of the Second World War, the charismatic prime minister was resoundingly rejected by the voters as their choice for peacetime leader. Instead Labour leader Clement Attlee - Churchill's deputy PM in the wartime coalition government - was given the job of leading the country into the post-war future. His party's socialist programme of radical reform and the nationalisation of key industries was backed so heavily by the voters it gave Labour its first ever majority government - with a commanding 146-seat lead over the other parties. When the parties took to the election campaign trail in the summer of 1945, it had been a decade since they last offered themselves up to the voters' mercy. But even before the ballots were cast it was clear the political landscape had changed beyond recognition since war with Nazi Germany broke out in 1939. Britain's eventual success in the war had been by no means a forgone conclusion and early military disasters had shaken the public's faith in the established and mainly Conservative governing class. The failed policy of appeasing Hitler also hung heavily around the Tory party's neck, and when the Conservatives gave only lukewarm support to Sir William Beveridge's plans for a post-war drive against poverty it became clear that if it was radical change people were after, they could not rely on Churchill's party to deliver. Churchill and Attlee had originally hoped the national government would see the war out, but delegates at the Labour Party conference were having none of it. So with the war in the Far East still under way and a little more than two weeks after Victory in Europe Day, the successful and popular coalition government ended and the date of 5 July was set for the election. The Conservative campaign was centred around the commanding figure of Churchill but he soon made some costly gaffes. Speaking during his first election address on BBC radio, he warned listeners that Attlee "would have to fall back on some form of Gestapo" in order to bring to life his socialist reforms. Churchill's attack on his trusted wartime deputy was immediately used by Attlee to highlight the difference between Churchill the war leader and Churchill the divisive political partisan. But although Labour's campaign was mostly trouble free and much better focused than that of the Conservatives, the polls indicated the party's 20-point lead from early in 1945 had dropped to just single figures by polling day. Undeterred by the polls, the Conservatives predicted an 80-seat majority, oblivious to the political cataclysm that was about to engulf them. When choosing the next prime minister the voters could not have been faced with a more different pair than Churchill and Attlee. The cigar and drink-loving wartime leader whose soaring rhetoric inspired the British defiance of the Nazis was being challenged by the bank manager-like Clement Attlee, once described by a Labour colleague as being a bit of a "mouse". 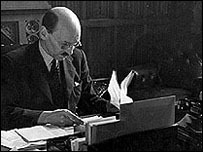 But Attlee, along with several other key Labour figures, among them Ernest Bevin, had benefited hugely from being given key cabinet appointments during the war. They had proved their competence and had gained valuable experience of the levers of government. But with Churchill leading the charge against Labour the Conservatives were confident that the voters would "Vote National" and "let him finish the job". With the fighting in the Second World War all but done, the election hinged on the UK's post-war future. That state-planning in the form of rationing, decisive intervention in the economy and conscription in both the labour force and the armed services had served the country well during the war was not in dispute, whether it should continue in some other form was. In the Labour manifesto Let Us Face the Future, the party promised nationalisation of numerous industries including coal, steel and iron. And, unsurprisingly for a "Socialist Party, and proud of it", full employment was also high on the agenda, as was the promise of a free National Health Service. 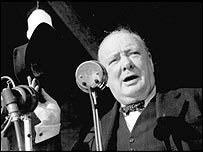 Mr Churchill's Declaration of Policy to the Electors also mentioned commitments to welfare, health and the replacement of bomb-damaged housing, but was clear that there should be an end to wartime controls over the economy. Building on the popularity of the Sir William Beveridge's report, the Liberals promised to enact their party members' vision of full employment and a strong social security system.